The Bayou Teche Black Bear Festival took place on Friday April 20th and Saturday April 21, 2018 (10:30 AM – 5:30 PM) in Franklin, Louisiana. Making its first debut in 2004 with its mission to “be the development of an eco-friendly environment for the endangered black bear population that resides in St. Mary Parish” . Residents from all around the parish including natives of Louisiana and out of state visitors enjoyed the beautiful weather along the Bayou Teche. CWPPRA’s public outreach team, arrived on the morning of April 21st in the Historic District of Franklin. Community events included, a color run, jambalaya cook-off, wooden boat show, live and digital music, along with multiple food and service vendors for the Bayou Teche Black Bear Festival. Residents were able to park downtown, then walk to which ever event or vendor they prefer. Families of all shapes and sizes were offered fresh food, hand crafted items, educational literature, and free music. CWPPRA was fortunate enough to table next to the Bayou Teche National Wildlife Refuge in which had a wildlife display with a corn snake, soft shell turtle, small American alligator, and other fresh water turtles like the red-eared slider. CWPPRA made an impact talking with the public about their experiences with wetland restoration and flooding. We met residents from places like Golden Meadow, LA — Wisconsin, and many local residents of Franklin. CWPPRA would like to thank the Bayou Teche Black Bear Festival for hosting the event this year, and to the residents who participated in the Festival. Bayou Teche Black Bear Festival, 24 April 2018, http://www.bayoutechebearfest.org/index.html. What we typically refer to as the Louisiana iris actually consists of five species native to Louisiana and surrounding regions in the Southeastern United States. Iris brevicaulis, Iris fulva, Iris giganticaerulea, Iris hexagona and Iris nelsonii are known as the Louisiana irises. These five species participate in interbreeding which results in the variety of irises we grow today. It is suggested to plant Louisiana iris between the months of August and September when they are dormant for optimal results. However, if you prefer to pick out the colors and types of flowers, it is best to wait until the flowers are in bloom to be sure of what you are planting. Garden cultivation and hybridizing have caused Louisiana iris to bloom in shades of blue, red, yellow, pink, brown, white, purple, and more. The wide range of colors and native quality make it an attractive addition to aquatic gardens and ordinary flower beds. Louisiana irises will grow best with as much direct sunlight as possible. 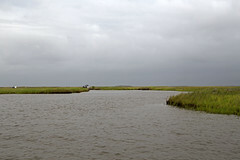 Within their native habitats, irises often grow along freshwater bayous and sloughs. This wetland vegetation has little tolerance for salt water. The Louisiana iris is at risk due to dredging through wetlands leading to saltwater intrusion. CWPPRA hydrologic restoration and freshwater diversion projects help regulate salinity and restore the natural hydrology of wetlands, ultimately preserving the iris as well as other native plants and animals. Learn more about how to #ProtectOurCoast and its native species at lacoast.gov.